Everybody wants to find a friendly auto repair shop that they can trust and rely on. If you are no longer satisfied with the way your current repair center delivers its services, it’s time to look for better options like the Best Boca Raton collision repair center at B&R Auto Body Works. No one wants to put the fate of their prized vehicle in the hands of shady auto shops that sprout like mushrooms in the streets. The B&R Auto Body Works Boca Raton Collision Repair Center specializes in restoring the frame, auto body and alignment of vehicles that have been recently involved in accidents. Clients should opt for repair centers that have already established a good reputation in the industry because car maintenance and repair is no small task. It is also important that the shop has a reliable track record, a criterion of which is honest service. That means their technicians do not take shortcuts in fixing your car and do not put on additional charges for services that were not actually performed. Since the B&R Auto Body Works Boca Raton collision repair center relies heavily on the trust and satisfaction of our customers, we ensure that we employ professional and approachable personnel who can deal with customers effectively. 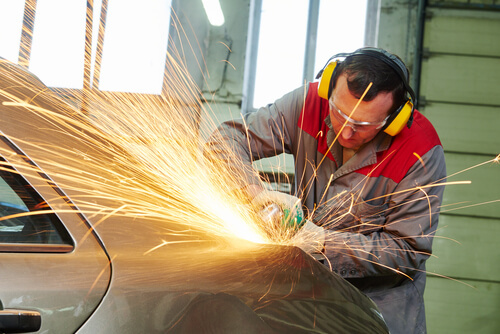 We know how difficult it is to find a collision repair center that will do the job right the first time. That is why the professionals at B&R utilize state of the art technologies to perform the absolute best auto body repair on all automobile makes and models. As well, we pride ourselves on our friendly customer service and many years of experience to help ensure the best results. We know that if you enter a shop that has rude and grumpy staff, you will likely leave and look for a more accommodating repair center. Our many satisfied customers often recommend the professional Boca Raton collision repair center B&R Auto Body Works to family and friends who need their car restored to showroom condition. Find out for yourself why B&R Auto Body Works is the #1 choice of all Boca Raton collision repair centers.